Ten Squads, Ten Stories is a series that concentrates on one team in the National Women’s Soccer League (NWSL), and highlights a player or theme. This installment features Kristen Edmonds of the Orlando Pride and how she has taken full advantage of a new challenge and opportunity with the newest NWSL team. Breakout star. It’s a sports phrase used on a regular basis. On some occasions, it’s a phrase reserved for players who are relatively new to the scene and have a big season. On other occasions, the phrase is given to players who have been around for a while, maybe battled back from injuries, and unexpectedly impact their teams. But the title doesn’t get used enough for the players who have been solid professionals throughout their careers when things start to click and the stats start rising up. At the end of 2015, Kristen Edmonds needed to make a change. She needed a change of scenery and a new opportunity. She felt that after two years of playing with the Western New York Flash in the NWSL — having good seasons playing as a defender — she needed to get back to what she does best on the soccer field. And what Edmonds does best is being a constant threat in the attack and scoring goals. 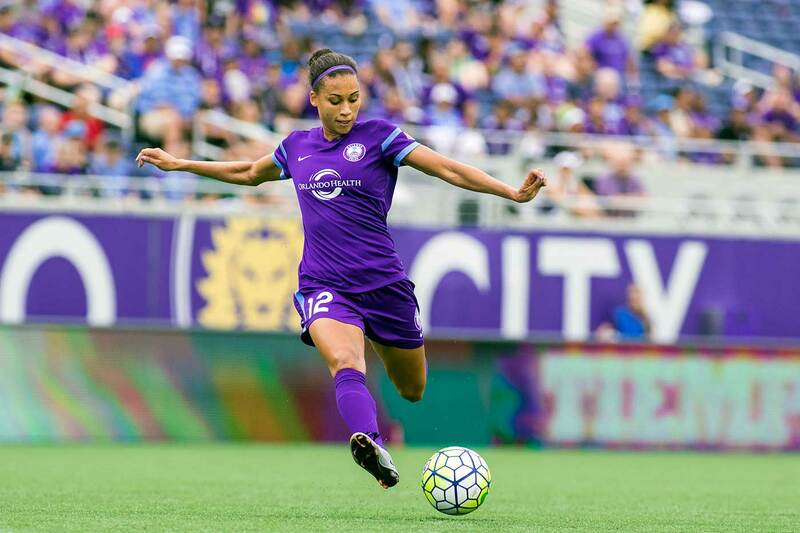 One season later, she has made herself the breakout star for the Orlando Pride in their inaugural 2016 NWSL season. Edmonds has been a fixture within head coach Tom Sermanni’s team, playing in all but one match for the Pride. She’s scored five goals and added in two assists to lead the team, and has logged the most minutes of any Pride player as well. Edmonds said that coming into the Pride for this season, she was given a chance to wipe the slate clean. With the confidence and prominent responsibilities given to her by the coaching staff, along with moving back into a more attacking position, she has seen her self-confidence rise in the past few months and that has been a main part to the growth in her game. Admittedly, Pride head coach Tom Sermanni didn’t know a lot about Kristen Edmonds during the team’s preseason. She came over to the Pride in the same deal that brought Becky Edwards to Orlando for a pair of draft picks. But when he first saw Edmonds come into camp and play in person, he knew he had landed a gem in that deal. After Edmonds’ solid collegiate career at Rutgers and a few years playing both domestically and in Europe, she felt it was time to come back stateside. She elected to stay close to her northeastern roots and signed with the Western New York Flash. “The reason why I went [to the Flash] in the first place is because I wanted to come back home to the states after playing overseas for a couple of seasons, and I was very grateful that the Flash brought me back over and kept me there for two years,” she said. She was thrust into duty right away in 2014 and played almost the entire season, mostly in the Flash’s back four. Toward the latter part of the 2015 season, however, she had been relegated to spotty starting duty, appearing in 11 of the team’s 20 games and starting in 10. When the offseason hit, Edmonds felt it was time for a new challenge and a new opportunity. Five goals with a few matches to play in a season will definitely give you plenty to feel good about. And the Pride supporters have embraced her positive play as well. Edmonds has shown a keen ability to set up a game-winner or score it herself, including a dramatic 95th-minute goal to give Orlando all three points in a 2-1 win over Boston on July 10. Sermanni was quick to point out, however, that while the goals are flowing in, the one thing that Edmonds has improved on this season is the consistency in her game. In preseason, he saw all of the quality Edmonds brought to her game but now as the season comes to a close, he credits her success to her ability to sustain a high-level work rate throughout the entire game. Edmonds also credits playing as a defender with the Flash for two years as key. She learned how to adapt to playing a new position and took away parts that helped her game grow, including how to connect with defenders attacking alongside her. In addition to fitting into the system in Orlando, Edmonds is also tasked with being a leader within the team. Edmonds is one of the more experienced players in the locker room, and Sermanni sees her lead by example on the field and wants that to translate throughout the team. Since setting a new single-game attendance record in its inaugural home game at the beginning of the season, the team has struggled to find the right balance, on the field and will fall short of making the playoffs. Despite the high expectations for the team, Edmonds credits the front office for making the players feel comfortable in Orlando, which has allowed them to focus on soccer, something she feels will help them massively for seasons to come. Heading into next season, Edmonds believes the Pride can finish this season strong and start building toward a big 2017 campaign.